I have been using this from their Visibile Difference line for about 6 months earlier this year, and I finally have gotten the time to jot down my thoughts on this product! This has helped keep my skin really hydrated, not because of its hydrating properties, but it optimized and boosted the efficacy of my moisturizer. Retinyl Linoleate:An exclusive retinol derivative that gently and effectively retexturizes skin,improves skin tone and skin clarity, and helps repair the appearance of sun damage. Skin is leftfirmer and smoother looking. Sodium Hyaluronate:Found naturally in the epidermis, this ingredient lubricates and attractsmoisture to the skin. Vitamin C Derivative:This stabilized form of Vitamin C provides antioxidant protection and helpsbrighten the appearance of skin. 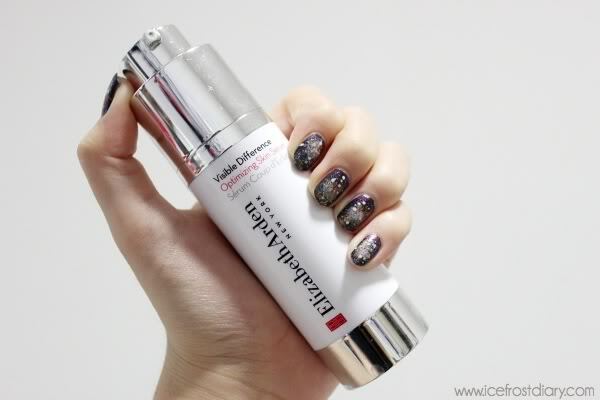 Elizabeth Arden claims that you can see visible results in 6 days, when using the new Visible Difference Optimizing Skin Serum together with the spa-inspired skincare regimen. This serum uses their retinyl complex to gently retexturize skin while preparing skin to receive the benefits of your unique skin type regimen. Using this will eveal healthy, glowing skin tone. First off, before I review the serum, let me complain about the packaging. For the price, I expect the packaging to be more luxurious feeling, probably in a glass bottle. When you twist the silver cap, the middle part of the cap with the nose will swivel up. This seems very fun and more portable because you will not expect spills easily if you were to bring it around with you for travel or such. Now, the problem with this swivel idea is that whenever I press down to dispense the product, the whole middle part gets retracted back to the bottle. There does not seem to be a lock mechanism where the middle cap will stay popped out. Maybe there is, because I managed to make my middle part stay that way after a gazillion tries. Nevertheless, the lock mechanism is very weak. Without the lock mechanism, whenever I press on the pump, nothing comes out because the whole thing gets retracted back. I hope they change the packaging soon. Texture is a lightweight white lotion and upon application, it gets absorbed into the skin fairly quickly (give it 1 minute or so), leaving your skin feeling supple and smooth. There is just a tad silicone feel to your face after application and I believe that helps to give your face a smoother finish. I use this right after I have cleansed and toned my face, before my moisturizer. When I began using this serum, I realized that my skin remained moisturized longer than if I have not used this. That is quite rare for me because having very dehydrated skin, my skin will just absorb the moisture in seconds, leaving my skin quite parched again. The serum somehow helped to retain the moisture of my skin and improved the efficacy of the moisturizer that I am planning to use right after. Imagine how it would work wonders on your serum at night! I like using this in the morning because of its fast absorption rate, which gives me enough time when I rush to work every peak morning. Overall, I will repurchase this again when I am out of this serum.